Life Is What You Make It….. Most homeowners have a secret room, although its often called a loft/attic/basement etc. When we first started looking at houses this time last year, one came on the market that had boarded out their loft and it was turned into a walk in closet and the pictures looked great (you could only access it from the master bedroom). We joked and said we would change that to a cinema room & unfortunately it kind of stuck…..so when we really started to look last September we always had it in the back of our mind that we wanted a loft that we could change into a room. Now, we are no where near being able to afford to fund a loft conversion and although we would love a cinema/TV room, we have both said about making it into a large master bedroom with en suite too. 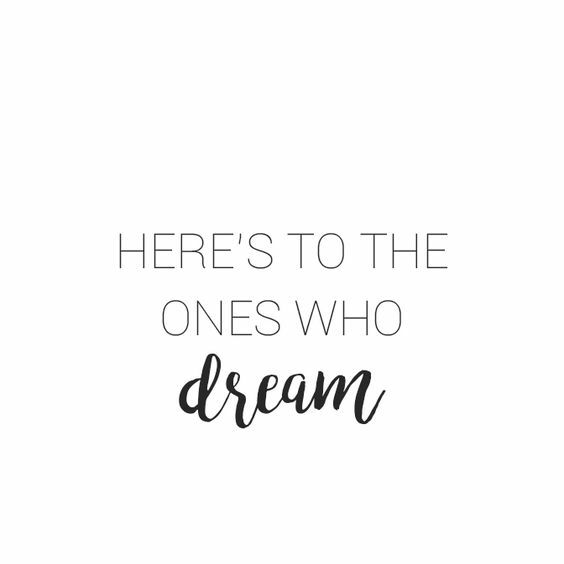 But, there is no harm in dreaming right? Well that was another small insight into our DIY adventures and our hopes for the loft! We always knew that our Front Room was going to be one of the first to be decorated as we found the brilliant white to be so clinical and unwelcoming. However, deciding on how we wanted it to look was proving to be something of a nightmare! We brought a gorgeous black leather sofa from DFS back in November (my dad kindly modeling for us below) and it was delivered mid January, so its pretty much a big statement piece itself. We needed something that wouldn’t be too over powering with our sofa and also compliment it well. After possibly 20 different paint samples, we narrowed our choices down to wanting Grey…..I kid you not, there are about 50 different shades of grey to choose from! We (me mainly as he was often at football) picked out 5 that we thought would go well in the room and not turn the room too dark. The 2 favourites were Chic Shadow and Goose Down by Dulux. We both felt that Chic Shadow was a bit too dark against the sofa, so decided Goose Down was our choice of colour. So with that in mind, we then just had to decide what to do with the Chimney Breast, do we have a painted feature wall or mirror what we have done in our bedroom and wallpaper? Here are some pictures we pinned on Pinterest for ideas…. It took us a while and when I say a while, I mean about 15 different wallpaper samples to finally find the one we liked. 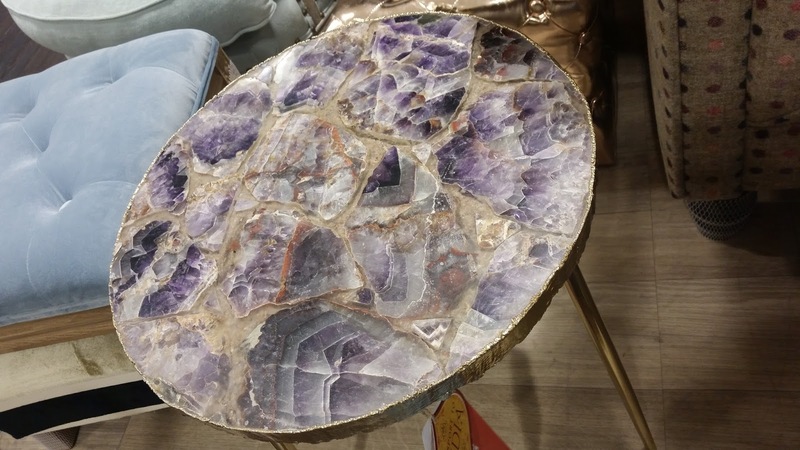 I am not sure what drew us to it or why we both liked it (ok for me it was that it had a touch of sparkle), but we both saw it at Homebase and said Yes, that’s the one. I don’t even think we brought it home to “hang” and see if we liked it, we just brought it there and then. Once we had everything, we wasted no time and set to work one early Saturday morning. With a couple of issues with the wallpaper, we had everything done and finished and the front room put back together by the Monday evening! However, we soon realised that we needed to upgrade my TV Stand that I had brought with me as the style didn’t really go with the room and it didn’t match our nest of tables we had brought earlier in the year. Matt did some bargain hunting online and managed to get a new TV Stand half price at Debenhams! I am guessing you want to see the finished product?! Well it’s semi finished, a bit like our bedroom! We want to get a nice big mirror for the chimney breast, a new lamp for behind the corner of the sofa as well as some pictures up on the wall. We are fussy and like to take our time over things to make sure we get the right stuff. However, I have been thinking recently about black and white photo’s in black frames will look quite nice behind the sofa. Just like the bedroom, as soon as its 100% finished I will defiantly show it off to you all! This post was originally meant to be about the Seafood Festival at Gunwharf Quays in Portsmouth that Matt & I attended last Saturday. Unfortunately it wasn’t that good and 100% not blog worthy! However, whilst looking round the shops I really wished it was payday and I had some spare cash to spend…..
With just £15 to my name and just enough fuel to get me to and from work for the next 5 days when I wrote this, I decided I was going to do some dreaming about what to spend my money on next month! So, everyone has bills to pay each month and savings (mine is for Canada next year) but after that most of us have a bit of money to play with. For me the amount of play money I have depends on how much I am saving that month and that all depends on how much I have dipped into my savings the month before hand haha! But this payday, I have some plans and things I want to buy! A new dress for Goodwood Races in August. The theme this year is navy and white – I am thinking a white dress, joined with a navy bag and shoes. Perhaps something like this one from New Look. Chrome Nail Polish by Sensationail. I really want the silver and cobalt blue one – I love how they look! A bargain for £6.99! Birthday Goodies for my best friend. Its her birthday towards the end of July and I always try to get something that she wants and a little something extra. Plants for the garden. I love our garden BUT its crying out for some greenery and colour! I got some terracotta pots a month or so ago, so I just need to get something to go in in! So only a few little treats, but sometimes that’s all you need to make you feel happy a few little splurges here and there dont hurt anyone! That reminds me, I think I will need to pick up some smellies too and maybe take Matt out for dinner or drinks one sunny evening too! So what do you like to spend your fun money on? Is it spent on take outs and drinks out of an evening or perhaps a new wardrobe each month! Why not sound off in the comments below so we can all have a natter together! I am probably not the first person that when moving in with their beloved had a certain idea as to how things were going to be decorated, but when it comes to reality you need to find a happy compromise. 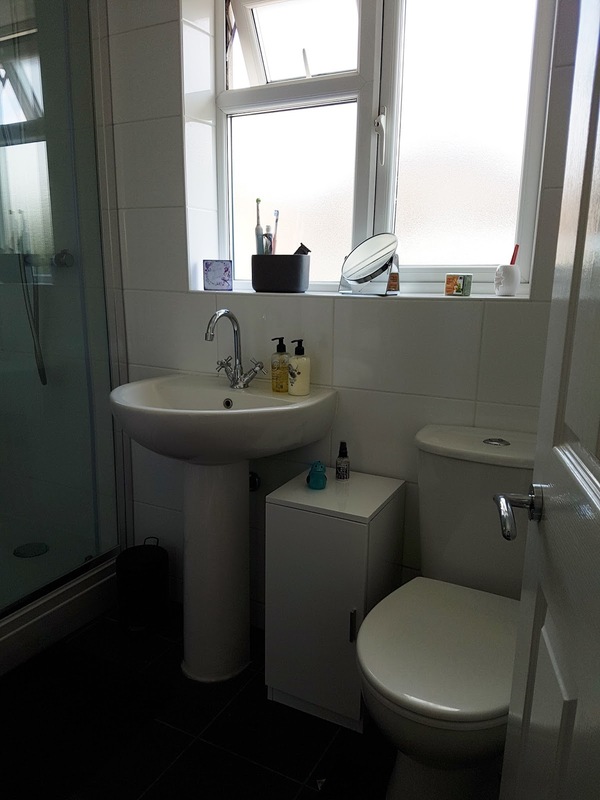 As you can see from previous posts, our first “project” was the bathroom and we love our bathroom – or shower room – now, its perfect for what we need and I sometimes forget that we ever had a bath in there! BUT, before the bathroom was even done we had the wallpaper for our bedroom picked out and brought. The paint samples sat on our chest of drawers for weeks on end and nothing to get us going. Then the rain came……it hindered our house warming plans over the first Bank Holiday in May and Matt decided late Sunday afternoon that we were going to start decorating the bedroom. With help from both sets of parents loaning us their DIY tools and knowledge, the bedroom was painted and back to normal by the Thursday (thank god we have a spare bed!). It was so nice to add a touch of colour to what was a brilliant white, clinical feeling room. We decided on Duck Egg Blue wallpaper, I am not sure if it was the colour or the pattern that drew our eyes, but it was quite possibly the first thing we have both agreed on instantly. We are really lucky with our bedroom that we have a chimney breast to act as a focal point and we knew that we would have that wallpapered with our feature colour either side. It wasn’t until we went to buy our paint that we realised we had no clue what to do with the other walls. I knew that I didn’t want all the walls to be duck egg blue, but I didn’t want them to be a pure white or cream either. So, we had a look at what “off” white colours were on offer and went with a Moonlight shade. When you look at the walls initially they do look white, but a warm white, its only when you look at the skirting boards (painted by yours truly) and the walls together that you can see that they aren’t pure white. Personally, I feel we have done really well to create a calm and peaceful bedroom. Its somewhere that feels naturally relaxing when you go in and there is no bright colours in your face when you wake up, its all feels very soothing. We are lucky that the front of our house is east facing so our bedroom only ever gets the natural light in the afternoon/evening, so our bedroom and lounge for that matter never get hot. There are still a few finishing touches that we need to do to our room, I would like a nice round mirror on the wall next to my side of the bed so I have somewhere to do my make up & hair. We also agreed that we would like a collage of photo’s of just us on the chimney breast (although I might suggest that goes on the wall nearer to Matt). Thankfully the previous home owners left the light fitting unexpectidly so we dont need to change that, but we could do with some new lamps on our bedside tables (our current ones were only £5 from B&M). Now all of these finishing touches seem pretty straight forward don’t they and could probably be done in 1 trip to either B&M, The Range or maybe even IKEA – however Matt and I are truly indecisive and like to make sure we consider all our options before committing to anything. Soooo the bedroom might be finished by Christmas haha! So although I can’t share with you the true finished product, this is as good as its going to get for a while! Sorry my blogging is a bit all over the show at the moment, I am very much enjoying being a home owner for the first time and everything that it encompasses! Our first few months (they have gone super quick!) hasn’t been without its problems, mainly as I know most people find, we had to get a new boiler! Thankfully it hasn’t put us too far behind with the projects we want to get done this year so we can have a year of rest and adventures in 2018! Our first project this year was the bathroom, we haven’t been blessed with a big bathroom, but that wasn’t something on our wishlist. Neither of our parents homes have large bathrooms, so its never something we have been used to really. It had everything we needed and was fully tiled with large white tiles and lovely black sparkly floor tiles, but the one thing that was wrong was the size of the bath! There was no chance of Matt getting in there for a bath, I tried twice, maybe 3 times to have a nice relaxing bath with some of my favourite bath bombs from LUSH, with no avail – I was too long! I have never had that problem before in my life! 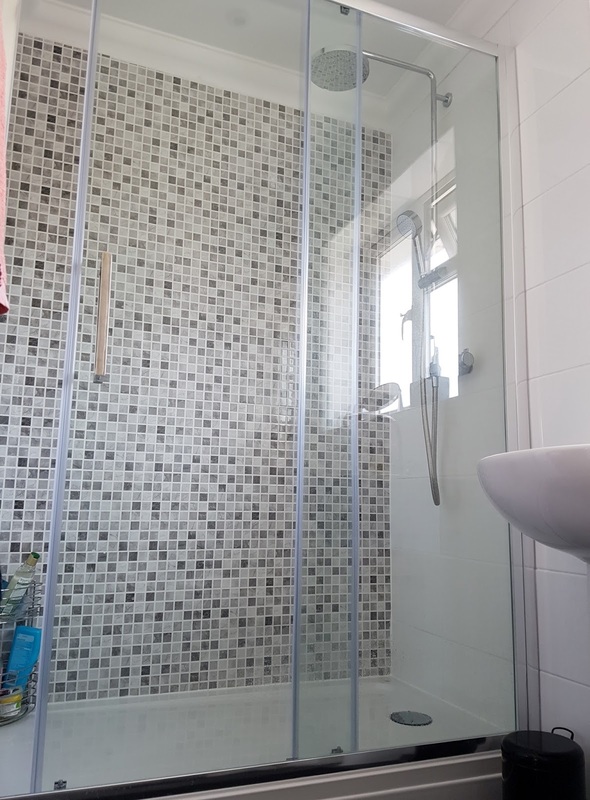 So, we used some money that we had been given when we moved in combined with our savings and decided we would strip the bath out and have just a shower unit. 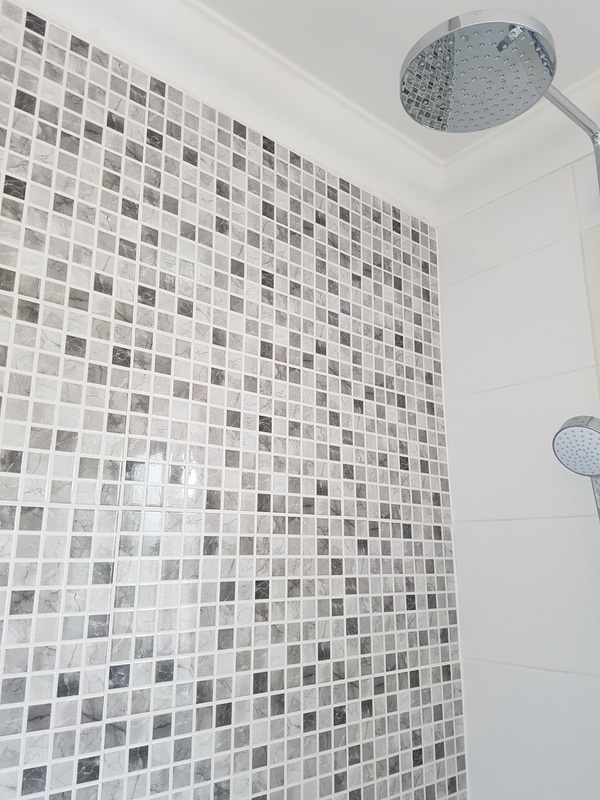 I had 2 requests…..mosaic tiles and a rainfall shower. I managed to get one of my requests fully but the 2nd had to be compromised. But I really don’t care as the finished product is amazing – I have never been so excited about having a shower in all my life hahaha! 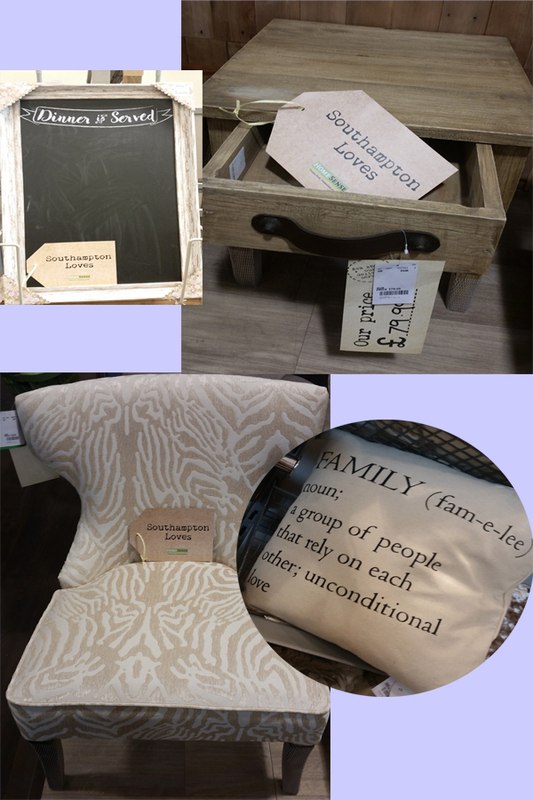 So I want to show you our finished product – here are a few pictures and I will share with you below where we purchased some of our bits, so you can recreate a similar look in your own home! Not Much Has Changed Here, Just A New Unit To Store Some Bits! Aaaaah! Our Beautiful New Shower Unit! Don’t you just love it! I am so pleased we managed to get our finishing touches this weekend and can start to make the finishing touches to the garden and make a start on the next room! So where did we get our stuff from? Our new unit I purchased (and put together) this weekend is from The Range, it cost £34.99 and has 1 shelve in there. It perfectly fits all our cleaning products and spare shower gel, toothpaste, spare toothbrushes and general bathroom necessities! Unfortunately I can’t find this on The Range website, but I am sure if you head to your local one they will have this one or something similar. I love our toothbrush holder! Its from Asda and cost £7, its a lot heavier than it looks and I love the granite look that it has. 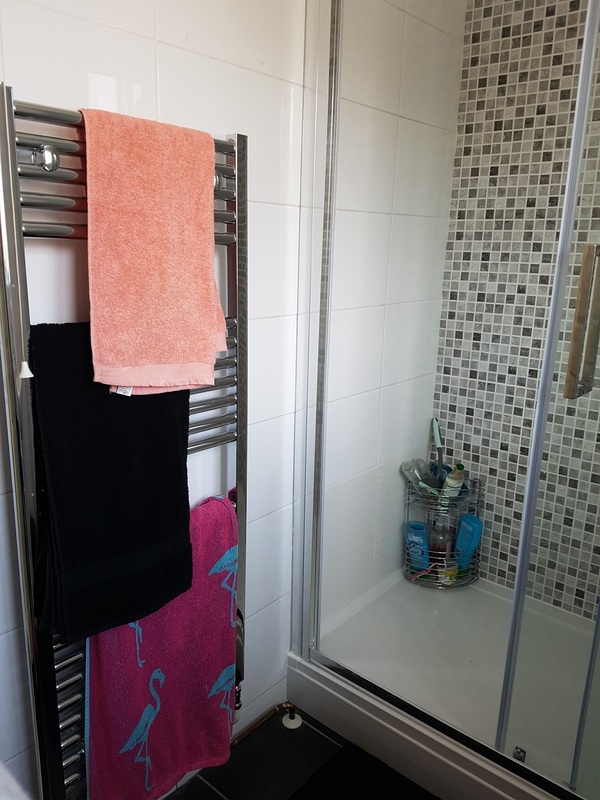 Our Shower Caddy is also from Asda, its rust free which is great and came with 2 stickers so it can be attached to the wall. However, at the moment we aren’t fussed on having it on the wall. It was a bit expensive at £15, but as its rust free which is something we were really keen on, so worth the cost! Our lovely shower is by a company called Mira, its a Mira Agile model which you can buy directly from Mira at £459.60 with a 5 year warranty. Our Shower tray is also from Mira, because of the size of the room ours its an unusual size, but its Resin Stone, so its strong and well made too! Now, for our tiles! We had to get some new white tiles which don’t quite match, but I am hoping it isn’t glaringly obvious when you look at these photo’s. They were just basic tiles on offer, I think £10 for a pack of £10, we over brought so were able to take a pack back, which is always a bonus! Our grey mosaic tiles are not mosaic at all. 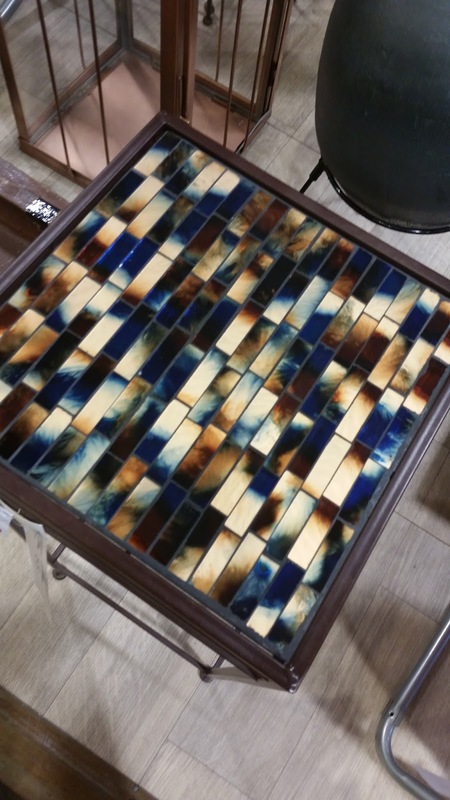 Its a full size tile that is mosaic effect, its £15 for a pack of 10, its an ideal option for anyone who loves mosaics but not the hard work of tiling them! All our tiles were brought at Homebase and as I mentioned previously if you have a full unopened pack, you can return them and get your money back – so my advice would be buy more than what you need, just in case and return any unused packs! 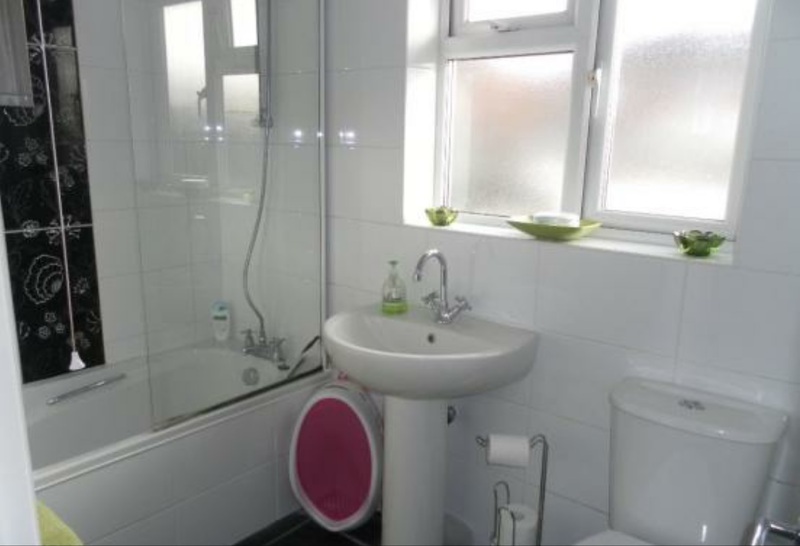 Well, I hope you have enjoyed a little insight into our bathroom! A couple of weeks ago I saw on a Blogging Community Twitter Feed that they were hosting a blogger event at a local Home Sense store, I was really tempted to go along and see what it was all about and roped my bestie in to come along with me! As always traffic was not on our side, but my little dot (my Citroen C1) powered along the motorway and we managed to get there not long after the start time. We were greeted by the lovely Fran and were given a choice of variety of bubbles and there was plenty of food to nibble on too! 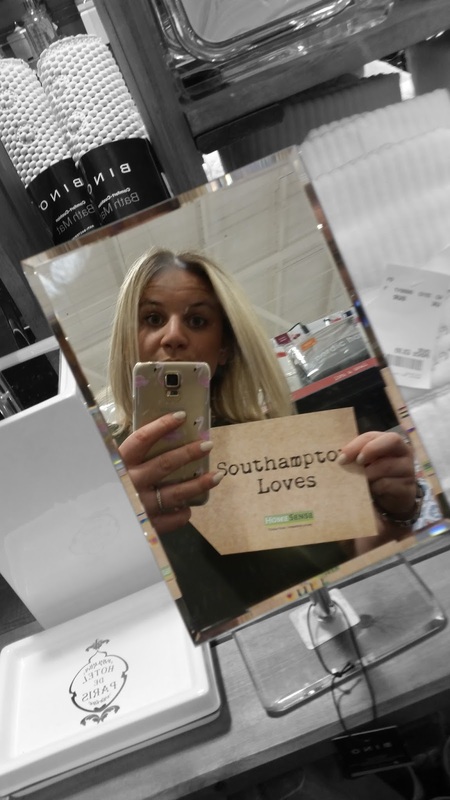 Fran gave us a Southampton Loves luggage tag and asked that we use this to include in any photo’s we take and make sure that is used as the # when we upload onto social media! We were lucky enough to be given a £20 gift voucher to spend in store on any goodies we fancy, is it just me or when you are given free money you can never decide what to spend it on?! I really struggled, I wanted to make sure my purchase was really worth while. A few weeks before Matt & I had spotted the glasses our welcome cocktails were served in when we went to Mexico. Now some of you may think that they were similar BUT I promise you, they were the same and were even made in Mexico & when I saw them at Home Sense, persuaded by Steph, I just couldn’t leave them there! 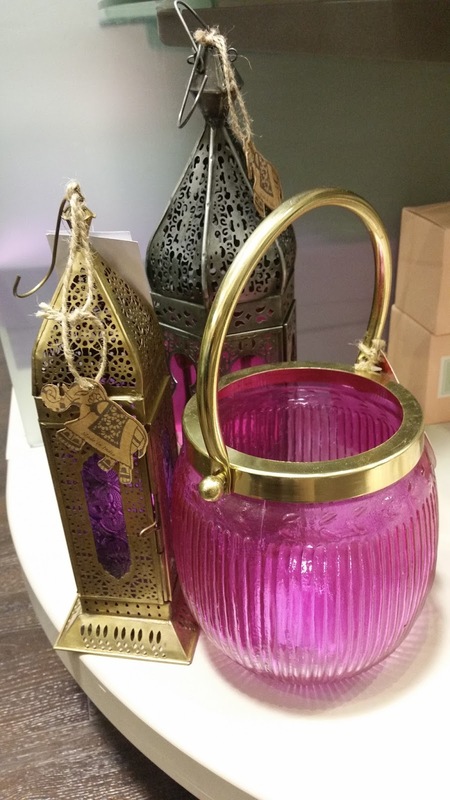 Now, whilst I love to shop and I don’t mind shopping for home ware and adding to my dream list, I never really properly looked and thought of how things would fit into our home that we will eventually buy….until that night, just how pretty are these table tops and gorgeous Moroccan themed lamps! 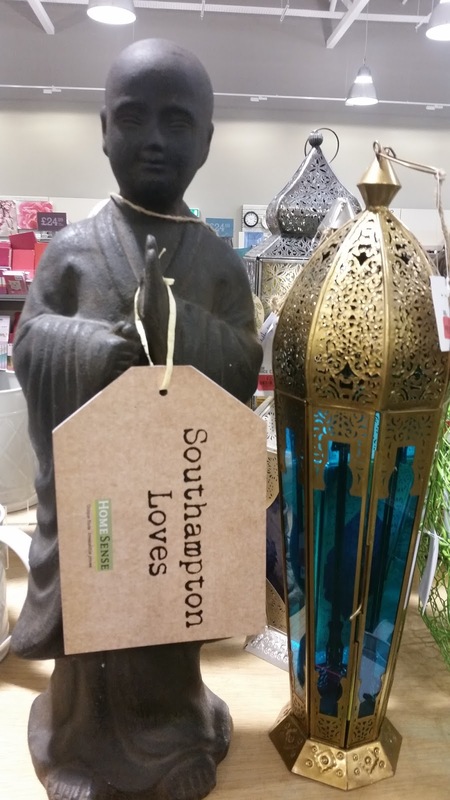 Perfect for a little courtyard garden or conservatory! Honestly, I had such a lovely time mooching round the shop and getting inspiration for our own home, I cant wait until the time comes that we can properly start shopping for the finishing touches! 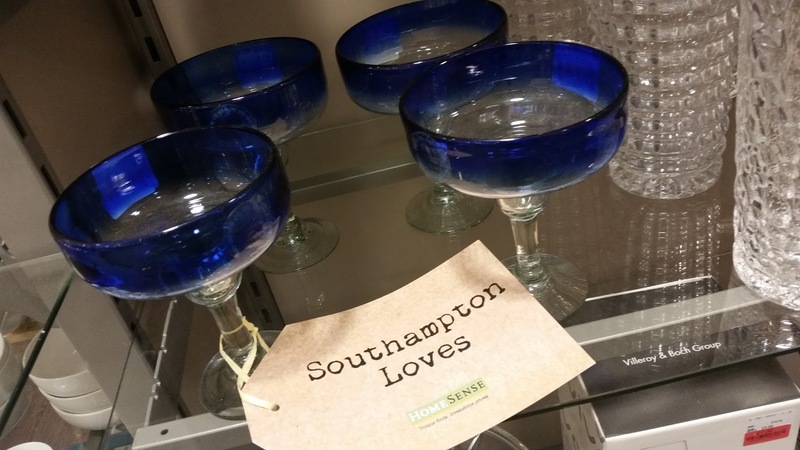 BIG thank you to Southampton Bloggers and Home Sense for having me, I can’t wait to attend the next event! So about a year ago I saw on Instagram a candle in the states called Clarity Candle, it’s basically a candle with a jewel in it which can be anything from $10 to $5000. When I was in the states I was too late to order one which I was gutted about, but figured I could do it next time I am out there. I went round to my bestie’s house a few months ago and she said to me she has been sent some candles review on her vlog and blog and did I want to take a look at them? So like excited kids we opened up the box and they were just like Clarity Candle, but called Imperial Candle and a completely UK based company. The description informs that the candle is 100% Natural Soy Wax, made and hand poured in the UK. There is also 2 Wicks to prevent tunneling and the thing that impressed me the most was the burn time of 120-150 hours! I really liked the pictures they have on the website of the candle and you can select a ring size or put suprise me. I hinted a few times to my brother and my mum about these before Christmas and I was really pleased to open my gift on Christmas Day from my brother and it was ‘Tropical Coconut’! 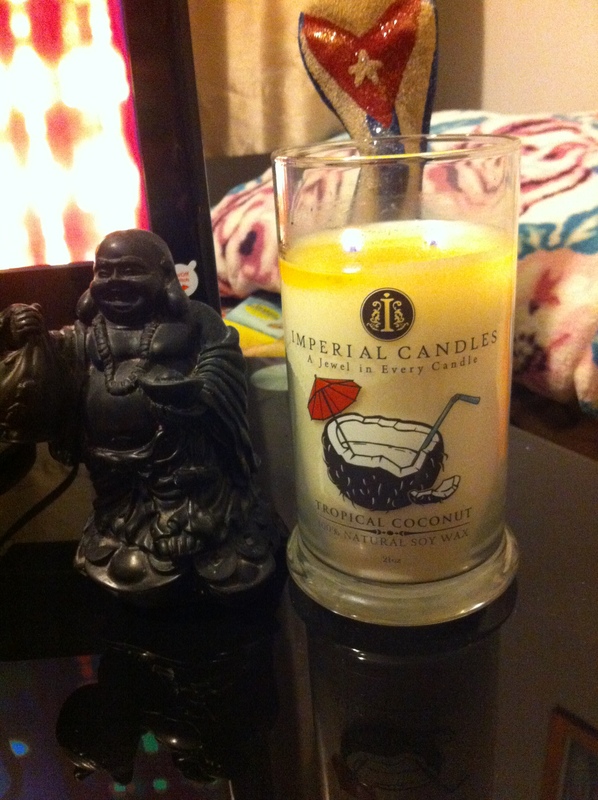 My Buddha Loves The Candle! It burns like the best candle I have ever had and the smell is devine, although I am really impatient so waiting until you see that gold wrapper just took forever! So when I saw the gold peeking out at me I took my tweezers and started to dig it out! I was really pleased when I unwrapped the foil and was greeted by a stunning sparkly heart shaped necklace! At first I thought it was a bit too shiny, but as soon as I put it on I loved it! 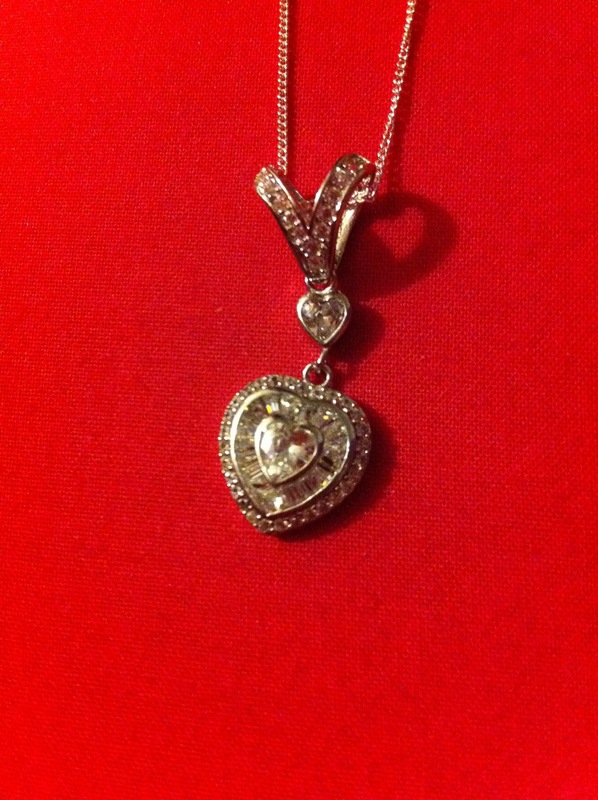 It even came with a little tag advising how much it is worth, the tag advised that my necklace is worth £25! If you would like to buy yourself a little treat or maybe even a special one for a friend head on down to https://www.imperialcandles.co.uk and spoil yourself or someone you love! Click to get my new posts direct to your inbox!